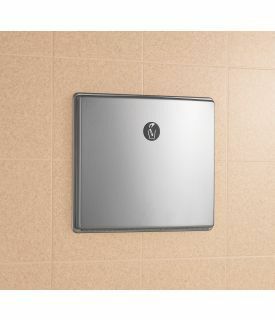 Part of the highly popular Bobrick ConturaSeries collection of washroom accessories, the Bobrick Model B-4353 Stainless Steel Recessed Sanitary Napkin Disposal is ready for mounting in framed rough wall openings that are 11-1/4 inches wide by 9-1/2 inches high and a minimum of 4 inches in depth. Crafted from 22-gauge, type-304 stainless steel, the receptacle is perfect for use in toilet stall partitions and in walls. A satin finish is employed in the unit to cut down on fingerprinting and reduce the need for cleaning the exterior. A self-closing door provides access for waste disposal and includes an internationally-recognizable graphic to indicate its use. The self-closing access door pulls down with less than 5 pounds of force in compliance with ADA and other barrier-free accessibility guidelines. A stainless steel cable door swing limiter is pulled down for access to the removable, molded, leak-proof polyethylene receptacle, which can hold up to 1.2 gallons of waste.